SafeWay is a reliable, single-use, breath alcohol tester that provides convenient, non-invasive alcohol screening at workplace, at home or anywhere you go. Safe Way disposable alcohol testers are available in multiple percentiles to test for various levels of breath-alcohol concentration (BrAC). Safe Way does not require batteries or costly re-calibrations. Based on a chemical reaction that is not sensitive to any gas other than alcohol, this highly selective reaction to alcohol reduces chance for a false positive result (more common with electronic breathalyzers). 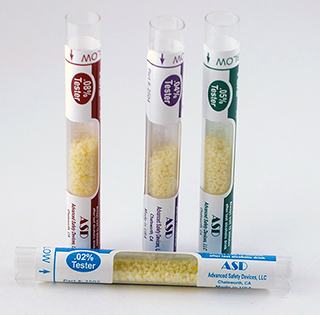 Safe-Way's sensitive crystals change color when exposed to alcohol. If SafeWay detects the presence of alcohol in an individual's breath, the crystals will change color from yellow to greenish blue. 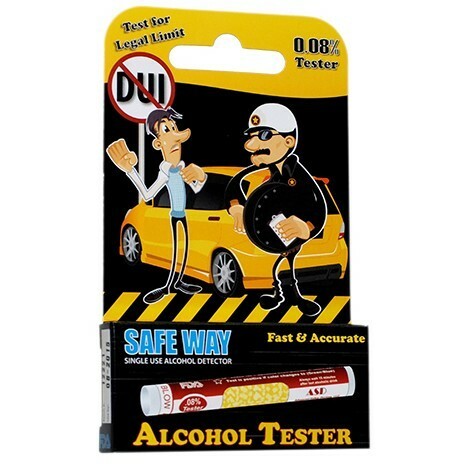 SafeWay is the perfect disposable alcohol tester for inclusion in your company wellness programs either on its own or as part of larger substance abuse educational event. 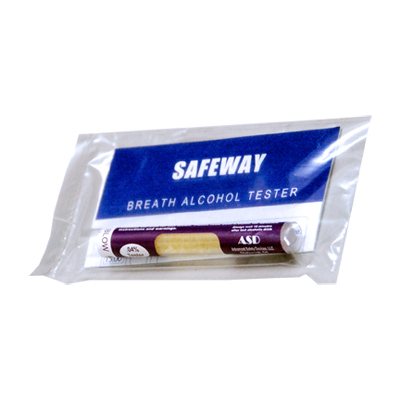 SafeWay is the best disposable breath alcohol tester designed for consumer and professional alike. It is available in four different percentiles ( .02, .04, .05, .08) to test various levels of Breath-Alcohol Concentration (BrAC). Testers are individually packaged & sealed with a User's Guide. Testers are not individually packaged. One User's Guide included with every box of 100. Each keychain carries one tester and instruction manual inside. Great disposable breathalyzer that we got instead of breathscan. The color change is easy to see and so far our BAT has had no problem screening people before we perform a blood test. Shipping is fast but that could be because we're in San Diego and they ship from Los Angeles. These are quick and easy to use. The disposable testers work just like the ones from bactrack or breathscan but the color coded testers are great when sorting through them. ASD does a great job with packaging for my promotional events at trade shows. They insert my business card into the packing so I can promote my business when I hand them out. Great to use, especially if you're about to get in a car. I was a little scared at first to break the capsule, but you just squeeze until you see the glass inside break! Shake it, blow for 12 seconds, and wait a minute. If the yellow grains inside turn blue/green then you know you're over the limit. I used the 0.08% tester so that's the legal limit here in California. Great for handouts at my holiday party this year. I just kept a bowl of them by the door, and an empty bowl next to it with a post-it note that said "keys" in thick black ink! They work perfectly fine even if they aren't real high tech. They are perfect for what I used them for. Will buy more for Superbowl Party. Easy to use and convenient. Color change is not extreme, but can definitely tell difference between over.08% and under .08%. It was clear enough to see in my car and prevent us from driving and instead sober up. I was issued this tester by my company command with the US Army. I ordered some for myself and received the military discount as a courtesy of my service which was nice. 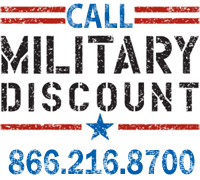 Wish they applied this discount for all their products, but it's nice to see some companies offering deals to vets. They're pretty simple to use and test. I was issued .04% testers but I purchased .05%. I noticed they're a little darker in color and easier to see a color change. I would definitely recommend purchasing these to keep on hand.